Hi there! I’m Bec and I’m so pleased to be taking over 52 Quilters this week. I live in Sydney, Australia with my hubby, three year old son and one year old daughter. Being a stay at home mum takes up the bulk of my time but whenever I find a quiet moment I go and hide in my crafty haven. My hubby calls it 'the study', but I'm slowly taking over... I started my first quilt almost six years ago and finished it five years ago - it took me nearly twelve months to work up the courage to quilt the darn thing. Nothing much has changed in that regard! Making things is in my blood. My great grandmother was a court dressmaker in the 1920s and 30s and my Nanna (on the other side of the family) was rarely without some kind of textile project in her hands. My dad is a skilled engineer who can build or fix just about anything. Making things is hardwired into my DNA. I HAVE to make things. And I've always loved making. My mum tells me that before I could read I would pull kiddy craft books off the bookshelf and make projects just from looking at the pictures. Mum fostered that love of making by having a big box of crafty things in the cupboard; cardboard, kitchen roll tubes, scissors, glue, paint, it was all in there. Gradually I became interested in a variety of crafts and the collection in the cupboard grew until it took up a whole cupboard of its own, and then a cupboard and a shelf and then a cupboard and three shelves... you get the picture. I've done lots of crafts over the years, quilling, beading, card making, cross stitch, knitting, crochet, dressmaking but my current love is quilting. My Dad was the one who taught me to use a sewing machine and various dress making skills (despite not being a sewist himself). Apparently pattern reading and clothing construction has a lot in common with metal fabrication - obviously! I used my sewing skills for making clothes and little things like bags, pillows and soft toys for the better part of a decade. I wanted to make a quilt - and even collected some quilting magazines - but I was scared of the precision I assumed was required to get all those little joins to match up. 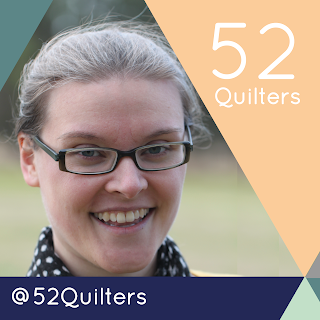 In 2010 I discovered the world of quilting blogs - “Oh Fransson” by Elizabeth Hartman and “Film in the Fridge” by Ashley were (and still are) two favourites - and the desire to quilt grew stronger than ever. In early 2011 I borrowed Material Obsession by Kathy Doughty and Sarah Fielke from the library and using all the wisdom contained therein I cut 100 6.5” squares and sewed them together to make my first quilt top. It was to my greatest joy when I discovered that although fabric is stretchy and unruly and tricky to be accurate with, it is also stretchy and forgiving and you can totally fudge things! By the time my son was born early in 2013 I had made 5 quilts - 2 throw sized and 3 cot sized. I was following a number of quilty bloggers and beginning to crave the gorgeous designer fabrics I saw in their quilts. And then I found Instagram. My son was a slow feeder so I spent hours each day stuck to the couch perusing quilt after endless quilt on my phone. And I knew I needed more! So at the end of 2013 I set up my little Instagram account as motivation, joined my first QAL, ordered my first parcel of designer prints and the rest is history! As it turns out, the thing that scared me the most about quilting, that being the accuracy required in piecing, has become my favourite part! I love planning projects, chopping up fabric and sewing it into a flimsy. The quilting part is not my favourite. I haven’t spent much time building my skills in this area and it’s definitely something I want to put more focus into over the coming years. I might just have a huge pile of unquilted flimsies to practice on! There are a few reasons that after trying so many different crafty pursuits quilting has remained my favourite to express myself creatively. The first is simply that I am driven to make things. I MUST make things, I was built to do so. In making a quilt I not only satisfy the urge to create, I also end up with a useful, practical end product. I like that! Secondly, I love colour and shape and I find fabric to be an excellent medium for exploring both of these elements. The third reason has a lot to do with my stage of life. As a mum to two little people, nothing stays done for very long in my home. Crumbs and toys abound on every surface and multiply twice as quickly as I can clean them up. However, when I make a quilt, it stays made! That is perhaps the most satisfying of all! In the coming year I am hoping to return to my sewing roots and resume garment making. I’ve made a few pairs of shorts for my little guy recently but I’d love to make some dresses for myself and my baby girl. I have a HUGE stack of quilt tops to quilt which will keep me very busy in the new year! But I’ll probably add in a new project or two. I just can’t keep away! Proof that I do occasionally finish a quilt! I enjoyed reading your post. Love your comment.....when I make a quilt it stays made.